I Almost Didn't Write This.. 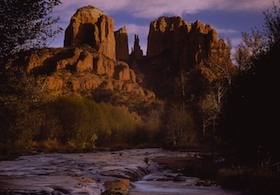 There are some places that are soooooooo special, you almost want to keep it to yourself.. keep it your own special secret memory.. and keep it uncrowded.. but, I was so moved by the "sharing" spirit of this web site that I decided to go ahead and tell you about some of the wonderful things I've discovered in Sedona. El Portal Lodge is amazing. I come to Sedona a couple of times every year, and I've stayed at lots of different places, but now, I can't imagine staying anywhere else. It's like I found my home away from home at El Portal. It's like being in your own really really really nice house. i can't say enough about how beautiful it is and how warm and friendly the staff is. One night, after dinner at Rene (delicious!) I went looking for the chapel courtyard mentioned on this site. I found that one lone bench and there was a guy playing guitar there and a gal was sitting by his feet, writing in her journal. I sat on the chapel steps and listened to a Bob Dylan song.. then went walking around holding hands with my honey.. looking at all the pretty shop windows and gardens while the music was still floating in the air. How romantic! On another evening, I went looking for a new sunset spot. I like the airport one, but it's always crowed and everybody has to stand. I'm 5 feet tall, so this isn't so good for me. I'd heard about Red Rock Crossing picnic area, which is now called Crescent Moon.. so I finally went there and found the best sunset view ever. It was less crowed and I found a place to sit and admire Cathedral Rock changing color and the reflection in the creek, it was just so amazing. Maybe some of your visitors will find and share more special secret moments like these. I'll be looking for more here on your site, which I love, by the way. Thanks. Can't wait to come back to Sedona. Join in and write your own page! It's easy to do. How? Simply click here to return to Share YOUR Happy Sedona Story.